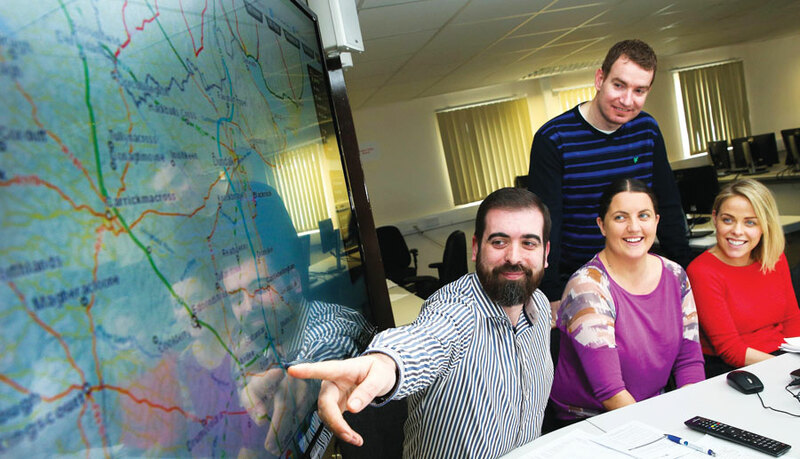 Ordnance Survey Ireland (OSi) is in the midst of a groundbreaking cartographic automation project that's transforming its product offerings and service capabilities. In partnership with Esri Ireland, OSi has developed the multiresolution data store (MRDS), an advanced cartographic solution based on the ArcGIS platform that enables OSi to automatically generate and update map products and services quickly, with minimal human intervention. When OSi captures new data and loads it into PRIME2, all that information will instantly—and automatically—filter down through all the organization's map projects and end up on maps like this one. This is an ambitious process-transformation project, and it's improving OSi's ability to respond to customer needs, save on operational costs, and provide the authoritative location framework that is essential to meeting Ireland's social, economic, legislative, security, business, and administrative requirements. 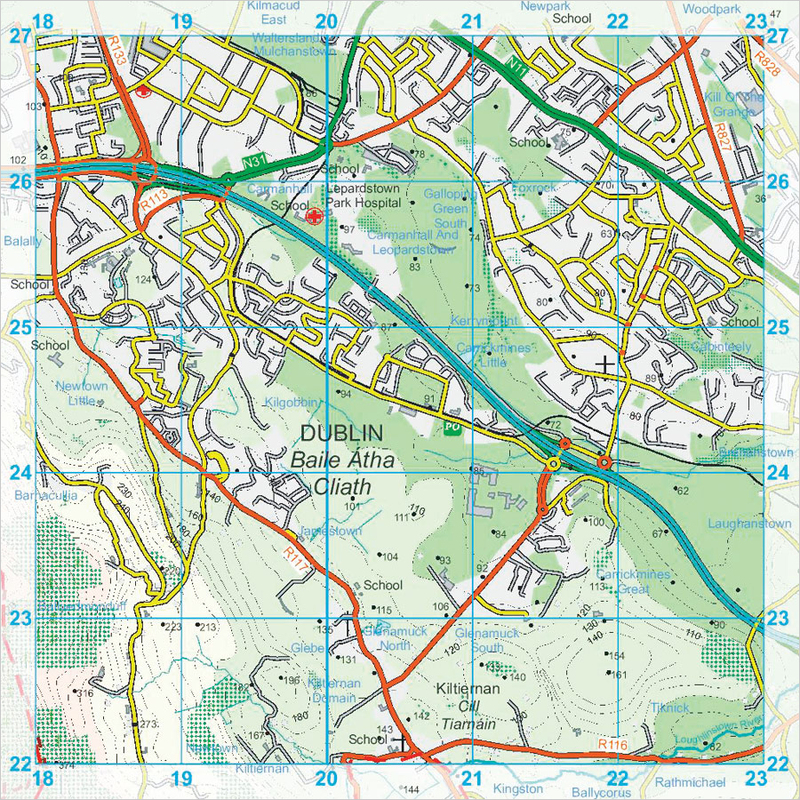 As the Irish national mapping agency, OSi's mission is to create, maintain, and provide the country's definitive mapping and geospatial information services to support citizens, businesses, and government. OSi's work is essential to developing Ireland's infrastructure. And in the wake of the 2008–2011 economic downturn—one of the worst Ireland has ever experienced—OSi had to meet its customers' growing needs and help drive economic recovery, all while experiencing a 30 percent reduction in staff. To make this happen, OSi needed to modernize how it managed its authoritative data so it could more quickly provide users with an increasing variety of information products at many different scales and resolutions. It was taking employees considerable time to manually update OSi's maps and services, and many of the organization's map-making processes got unnecessarily duplicated because of repeat data sources. What OSi needed to do was replace its tile-based cartographic data (which had limited attribution) with a seamless database of real-world objects with rich attribution. The organization had recently consolidated all its digital mapping data, across all scales, into a single database called PRIME2. The next step was to create a framework of GIS-based processes that will automatically refresh OSi's map products and services when new data becomes available. This—the MRDS—is OSi's next great innovation. At just over 190 years old, OSi is no stranger to innovation. It created the first original land survey of the entire Irish island in 1846, making Ireland the first country in the world to be mapped at the detailed scale of six inches to one mile. Later in the nineteenth century, pioneering employees at OSi developed groundbreaking survey methods and equipment, such as bimetallic parallel bars, that brought previously inconceivable levels of accuracy to the land surveying process. OSi maintains an active interest in new technology and process advances—particularly those that improve the currency and quality of its maps. 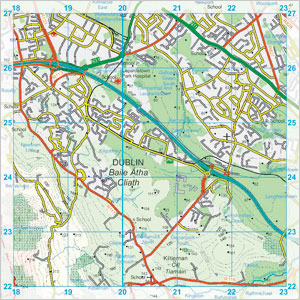 To generate many different products from PRIME2, such as large- and small-scale maps and interactive web services, OSi worked with Esri Ireland to develop the technological platform and process models. The first 18 months of the project consisted of a knowledge transfer from Esri staff, including Esri Ireland, to OSi's product generation team. Now the team is in the product phase of the project, using ArcGIS Desktop and the Esri Production Mapping extension to create the sophisticated process models that can do things like add symbols and resolve conflicts on their own. Critical products and services are expected to be delivered later this year. Esri staff taught OSi's product generation team about automated product generation. Although a few other national survey organizations, such as the Netherlands' Cadastre, Land Registry and Mapping Agency, have introduced similar automated processes, OSi is the first organization to start with large-scale topographic data at 1:1,000 scale to derive all its products at multiple scales. These include 1:1,000 large-scale urban maps with precise building and road outlines; 1:5,000-scale rural maps, which have less detail; and the smallest-scale maps—up to 1:250,000—which highlight important landmarks and main roads. This project exponentially increases the amount of data being generalized via automatic processing, which is remarkable. "It is the most important advance in cartographic product automation in Ireland since the introduction of digital maps over 30 years ago," said Colin Bray, OSi's chief executive officer. The MRDS will greatly benefit the hundreds of government, public sector, and commercial organizations that rely on OSi mapping, as well as the thousands of people who use OSi's printed maps and road atlases. Primarily, and most significantly, the project will empower OSi to provide better-quality maps. When the organization captures new data and loads it into PRIME2, all that information will instantly—and automatically—filter down through all its map projects. This will, in turn, help OSi's diverse array of users accurately integrate multiple data sources into their analyses so they can make well-informed decisions. Since the Irish government's reform program centers on better decision-making, this is critical for stimulating the Irish economy and supporting other key national priorities. When the MRDS project is complete, it will take OSi much less time to get its map products to market. At present, updating the organization's online map viewer involves numerous manual steps, so it is only updated every six months. Upon completion of the MRDS project, however, OSi will be able to update its web services—including MapGenie—much more frequently, which will benefit its commercial customers in particular. Similarly, OSi currently only refreshes its 1:50,000-scale leisure map series once every five years by updating about 50 of its 250 tiles each year. With new automated processes, though, OSi will be in a position to update these paper maps more regularly, printing off small runs at more frequent intervals. This way, citizens and businesses will be able to get ahold of up-to-date maps more easily. Automating its map updates is also expected to save OSi money. The organization will see savings year-on-year partly by reducing IT hardware costs and partly by coping with a natural reduction in staff due to retirements. OSi expects to get a full return on investment in its cartographic automation system within two years. The MRDS project is another major milestone in OSi's long history of innovation in the mapping world. Not only will this adaptive GIS infrastructure be able to meet the country's wide-ranging needs today—delivering high-quality mapping products quickly and cost-effectively—but it also has the potential to meet the unanticipated requirements of Ireland's government, businesses, and citizens in the future. Additionally, it puts OSi in a stronger position to keep innovating.